Since no one else made it by the deadline of 5 p.m. today, the candidates for presidential office will be two – current President Valdis Zatlers and Saeima deputy Andris Berzins. 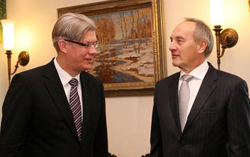 Valdis Zatlers and Andris Berzins. Zatlers was nominated by both Unity and For A Good Latvia, while Berzins was nominated by five MPs from the Greens/Farmers Union, informs LETA. The first round vote is scheduled for Thursday, June 2, and it will be with ballot slips, with deputies selecting one or the other candidate. 51 votes are necessary for victory.